A friend of mine who is fairly recently gluten-free saw this Love with Food box on our dining room table the other day. (I had just taken the photograph and hadn’t put away the snacks yet.) “What is this?” she asked, drawn to it immediately. I told her: Love with Food is a monthly food subscription service. They only work with producers who make high-quality, delicious food. All the snacks are free of artificial coloring, flavoring, msg, trans fat, high fructose corn syrup and hydrogenated oil. They have good taste. I always like the food. And they have a gluten-free box, curated by one of our favorite people, K.C. Pomering from G-Free Foodie. That gluten-free box consistently has great products, ones we already love — some of them so much so we work with them as sponsors of this site — and some that are new to us. We keep the snacks in the car for the kids when they are hungry after swimming or when we’re in the city. And for every box Love with Food sells, they donate two meals to a hunger organization, such as No Kid Hungry. Plus, they just dropped their price to $24.99 a month for the gluten-free box. You’d pay that much in snacks in one trip to the grocery store. We really do love Love with Food. We think you should too. That’s why we’re happy to announce Love with Food as our latest sponsor. We asked K.C. to tell us more about Love with Food. How would you describe Love with Food as a company? 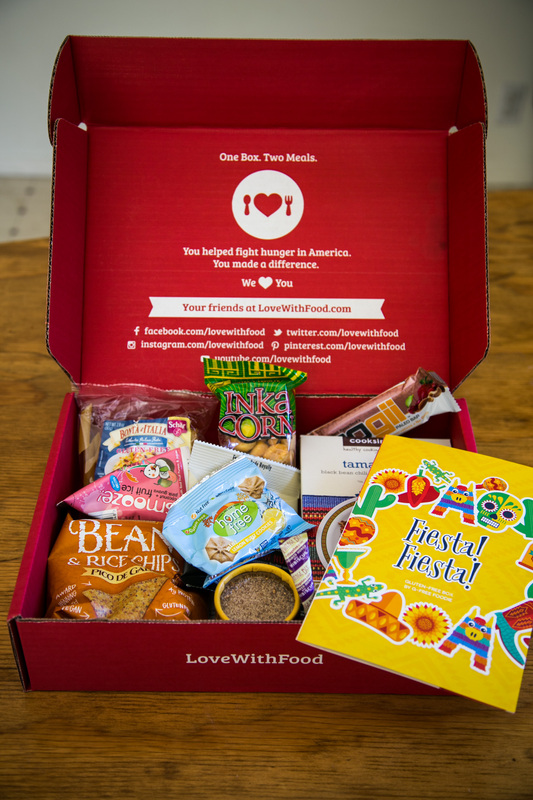 Love With Food is a subscription box company with a very real heart. Love With Food helps customers discover new organic or all-natural foods very month, by delivering a curated box of unique, hard-to-find tasty products directly to their door. For every box sold, Love With Foods donates a meal to a food bank in the US (via Feeding America Network, Share Our Strength – No Kid Hungry and other charities). For every Gluten-Free Box sold, two meals are donated to children in need. Why do you feel it is important to curate boxes of gluten-free food for folks? There are great companies making delicious, 100% gluten-free products that lots of folks don’t even know about! We here at Love with Food try to connect those products with the people looking for them, so our members find new foods to love, and they know those products are totally celiac safe. It’s a mix of small artisan producers and companies that are just starting out, and the larger companies that make a concerted effort to produce clean, natural, tasty gluten-free products. We get certifications, gluten-free testing information and review manufacturing practices for every product that goes in the box. In some cases, I even tour the plant. What kind of foods do you like to provide? The Love With Food Gluten Free Box by G-Free Foodie features 12-15 delicious products every month. I won’t ship anything that isn’t tasty and 100% celiac-safe. Beyond that, all the Love With Food products are totally free from artificial flavors and coloring, hydrogenated oils, trans fats and high fructose corn syrup – these products are organic or all-natural, every time. Can you share a customer experience that means a lot to you? Just recently, a mom of a newly gluten-free kiddo shared that she was so happy and relived that her son is excited every time the red box shows up at their door — all healthy, all-natural products that she knows are Celiac-safe — so she lets him tear into the box when he sees it. That’s why we do this. We think you’ll like Love with Food as much as we do. We hope you support them by subscribing. Right now. you can save 50% on a box for August. Love with Food is giving away an August box to three readers of Gluten-Free Girl. Leave a comment about why you are interested. Winners will be chosen at random on Friday, July 3rd and notified by email. Wow!! What an exciting concept. Will definitely look into it more. ? Always on the look out for tasty GF snacks! Sounds like a great idea! I’ve just begun my gluten free journey due to health issues and Dr.’s suggestions. This would be wonderful to win! What a wonderful company to donate that much to those who need the food most! When I volunteer at the local homeless shelter, I always see the need for special, safe meals during winter months and I can’t guarantee that to anyone. I hope more companies follow their example by donating to food banks. New gluten free items to try would be great. I would love to try this service. My daughter was recently diagnosed. I hope to win a box so I can see if she likes it. Always looking for easy ways to be gluten free! These products are almost all new to me, and I appreciate the commitment to small businesses. I love to get mail and a package that is a surprise is even better! My GF hubby has a very physically demanding job & needs small snacks for ongoing energy. BUT getting him to take proper portions of healthy snacks is an ongoing… challenge, LOL. Maybe a special, easy-to-use box of snacks would help us get off the tension-go-round over this! I’m ALWAYS looking for healthful desk snacks. I love trying new gf food! GF snacks that taste good are so hard to find. Being GF has been life changing… Always searching for delicious new things to try.. It can be so hit or miss! We love trying new snacks, so this would be perfect! And I love that they donate to worthy causes. Thanks for the chance to try a box. We are always looking for gluten free snacks for our son with Celiac and do not like artificial flavors, colors, etc. – this sounds neat! I work long days and always end up grabbing something “celiac safe” but often unhealthy at work- such as M&Ms. This box would be great! My son and I are both gluten free and he’d love new snacks to try! I would love to have some delicious and SAFE snacks to try! It reminds me of the mystery grab bags some stores used to sell. As kids we loved them because you never knew what you were going to get. I haven’t seen any retail place do that in a long time. Probably illegal now! HA! Want to know about these snacks. All the research has been done for me. We tend to get in a rut when it comes to gluten free snacks, and the chance to discover new ones-what’s not to love? We’d be very excited to be chosen for one of the August give-aways. Love that you give back to the community too. It’s a good reminder for all of us to continually find ways to do that in our own ways as well. Just be careful. Not all of their snacks are celiac safe (some made on shared equipment). Susie, I know that K.C. visits the plants where the foods are made, if there is any question. Companies are required to say if there is shared equipment. But many companies also take great precautions to make sure that equipment is cleaned and safe before they run the gluten-free items. So Love with Food promises the products they offer are celiac safe. Wow, my preschool age son would love that. He’s snack obsessed. Always looking for easy to grab snacks for backpacking. I would love to try this. We used to get a GF box (not recalling the name of it) once upon a time but found that the products weren’t usually anything we would want to buy after tasting! It sounds like these are more discriminantly chosen! Getting a box of happy surprises once a month sounds wonderful. I’d love the chance to try some new snacks that are gluten free so my whole family can enjoy them! I love this concept. What a wonderful way to fund food for the less fortunate. It’s great to get tasty treats and help those in need. How neat. What a wonderful idea. Wow…looks like a fun way to try new gluten free snacks! Snacks in our house take over the cupboards. We’re all getting sick of the old standbys. I love that they’re in portion-controlled packages too! Great idea, would love to try! Great idea! I know the red box would be a big hit with my kids too! I have heard about this concept of a snack box before, and I really like the idea. I had no idea they had a gluten free box. We just figured out my son who is 3 had a sensitivity to gluten and I would love to try some new snacks for him. My snack drawer at work is pretty dull – this would be a great way to try new things! I have a hungry gluten free teen that always swipes my snacks; this would be a fun treat! Yum! We just pre ordered your new book too!